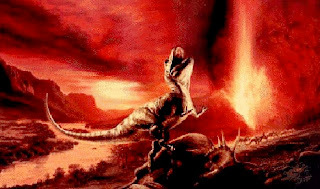 The notion that an asteroid collision directly caused the extinction of the dinosaurs is pretty much accepted by the general public, although, in truth, that theory has always been controversial inside scientific circles. Personally, I never entirely bought it. Just didn't make sense. While the asteroid impact appears to be a geological fact, there's so much it doesn't explain. Crocodilians, turtles, sharks, and birds continued on as if nothing at all had happened. This was a much more selective mass extinction which, at least to me, has always suggested an already changing climate, possibly combined with some kind of global plague. The same sort of thing is happening every day in the wildlife of our modern world. 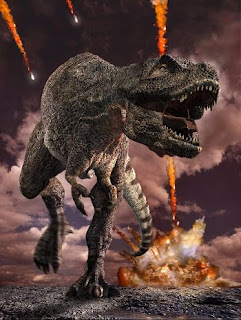 Nevertheless, at the calculated date of the killer asteroid, about 65 million years ago, some 70% of all life on Earth suddenly became extinct, including not only the dinosaurs, but also the giant marine reptiles and flying pterosaurs, as well. Or so we've thought, until now. Scientists recently analyzed dinosaur bones found in the Ojo Alamo Sandstone in the San Juan Basin, and came away with a startling surprise. 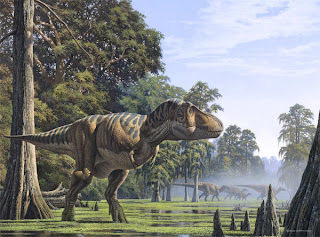 Based on detailed chemical investigations of the bones, and evidence for the age of the rocks in which they are found, the researchers now suspect that the new fossil evidence suggests that some species of dinosaurs continued to survive, possibly as much as a million years, beyond the date of the deadly asteroid impact. Ridiculous though it may be, I still hold out hope against all odds that there's some secret steaming unexplored jungle, hidden perhaps in the depths of the Congo or the Peruvian rain forests, where the great Thunder Lizards may still exist. This is a much more romantic notion rather than a scientific one, I'll admit. But I've always been more of a dreamer, than a scientist. In the tiny Berkeley apartment where Jim Powell has lived since 1992, there's a California license plate on the wall that says "POETICS." Powell didn't buy it, but found it years ago while clearing litter alongside Interstate 880 in Oakland. "You know on the roadside you'll see a sign that says, 'This section of freeway cleaned by 'so-and-so'? So a group of Deadheads I knew decided to clean the mile beside the Coliseum. Caltrans gives you an orange Day-Glo vest and gloves. You go down there beside the freeway and everything is covered with 14 layers of diesel soot. Someone found that license plate in the ivy in one of the cloverleafs and said, 'This belongs to you.' Whoever owned that plate had their car stolen. And the people who stole it ditched the plate into the ivy. "So that's my 'poetic license' and it's a stolen poetic license, which is appropriate," Powell says with a grin. "Your poetic license should come to you that way." Aside from writing science fiction, mystery, horror, and blood-and-thunder adventure pulp stories, primarily for an adult audience, for the past couple years it's also been my very good fortune to write a number of children's books. This is something I'd wanted to do ever since I first started to write professionally. Books were very important to me when I was a kid. They held a special kind of relevance and magic that I couldn't find any where else. 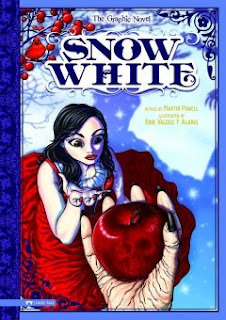 Stone Arch Books, one of my favorite publishers, have worked with me on a wide range of very fun projects, everything from traditional Fairy Tales with my own twist, to my personal interpretations of classic literature. It's been a grand ride, and I'm very happy to say that the wave is still continuing. I have five more new Stone Arch volumes being published this summer. 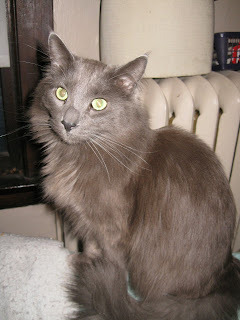 Today, I'm the subject of the Stone Arch Blog. Hope you'll want to check out the others, too, at your neighborhood library or bookstore. Well, MicroCon 2009 was a surprising success. Surprising to me, at least. Must confess that I had my doubts. I mean, none of us can pick up a newspaper or turn on the TV or the computer without being barraged with the depressing state of the American economy. Everyone is supposed to either be broke, or are afraid that they'll soon be broke, right? Also, there was the weather. Hardly ideal. The rain was coming down in sheets as we arrived at the Fairgrounds. Lisa and I were soaked to our underoos while performing the simple task of hauling my several boxes of books into the building. Lightning was flashing, too. Before we unloaded the car a full blown thunderstorm was underway. Annoying and uncomfortable, of course (although I still really like thunderstorms), and yet...and yet there was an early line of fans, already fully sixty feet long, standing there in the tempest, joking and laughing together, more or less patiently waiting for the convention to officially begin. 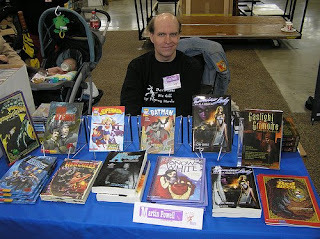 Not only did the fans show up in swarms, I actually signed and sold quite a heavy number of books, very nearly making MicroCon 2009 my most successful comic show yet. Only at last year's FallCon did I sell and sign more books. The boxes were fewer and considerably lighter when Lisa and I packed up to leave. 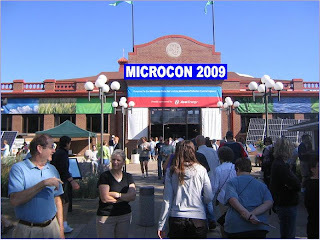 So, as I wrote at the start of this blog, MicroCon 2009 was a success. And I had my doubts. Shows you how much I know. Minnesota fans have made me feel very warmly welcome since 2001. Can't begin to tell you all how much that means to me. Yes, I can. It means the world to me, and nothing less. So thanks to all who stopped by my table to meet and talk, and I especially appreciate your continued support of my odd scribblings. After all, you are the reason I'm here. Special thanks to Michael May for providing the photo. New Dinosaurs from the Gobi! The announcement of newly discovered dinosaurs is always exciting to me. Several new species, completely unknown to science, are found every year. Most don't make the newspapers, but each of them provides a more vivid and detailed vision of the great reptiles and their world, a very different Earth than the planet we currently call home. Most recently two brand new dinosaurs have been unearthed among a treasure trove of fossil skeletons in China's Gobi Desert. The discovery of Xiongguanlong baimoensis, an early ancestor of the enigmatic Tyrannosaurus rex, is especially remarkable as it helps fill in a large gap between the early and late chapters of tyrannosaur evolutionary history. Xiongguanlong, which is Mandarin for "grand pass dragon", was an impressive predator, with a mouthful of 70 flesh-tearing teeth, standing 5 feet tall at the hip while weighing almost a third of a ton. Formidable and frightening, truly, but was still relatively diminutive when compared to its famous descendant. 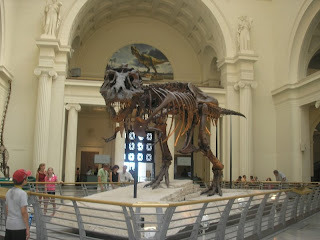 The Tyrannosaurus named "Sue", magnificently displayed at the Field Museum in Chicago, the largest and most complete specimen known, stood 14 feet tall at the hips, weighed between 6 and 7 tons, and was over 42 feet long. 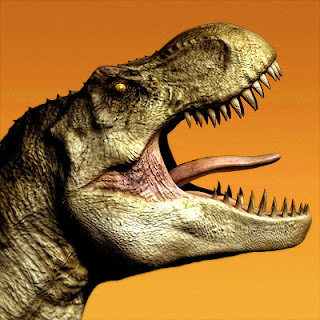 Tyrannosaurus rex (for the record, I absolutely detest the term "T-Rex", an abominably dumbed-down nickname) has long been my favorite dinosaur. I think it is the single most astonishing and charismatic animal ever to live upon our planet. 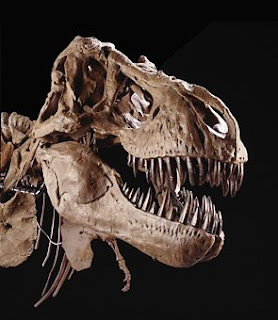 Little wonder that even 65 million years later, Tyrannosaurus rex continues to reign in museums, movies, and our imaginations. It's fabulous that something so very ancient continues to happily make me feel nine years old. A new ornithomimosaur, or ostrich-mimic dinosaur, called Beishanlong grandis, was also discovered by the Gobi expedition. The animal weighed an estimated 1,400 pounds and rivaled the late Cretaceous ornithomimosaur Gallimimus in size. And it wasn't yet fully grown! While analyzing a cross section of a lower leg bone, the scientists have be able to determine the dinosaur's age by counting growth rings. It appears that it was only about 14 years old at the time of its death, and the dinosaur was still actively growing. The abundance of new dinosaurs from Chinese localities like the Yujingzi Basin, allows palentologists to study the long history of dinosaur evolution by geographic and environmental parameters in a way that is impossible elsewhere in the world. Personally, I can't wait to see what they dig up next! 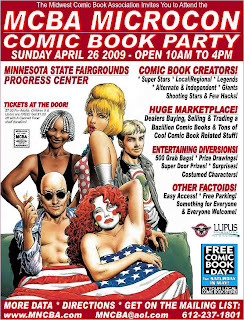 MICROCON Comic Book Party -- This Sunday! If you live in or around the Twin Cities area, I hope to see you April 26, this Sunday, at MicroCon at the Fairgrounds in Saint Paul, MN. 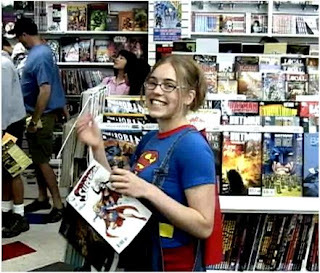 Every year MicroCon grows and evolves and this year the Guest Creator list is bigger than ever, including Terry Beatty, Terrance Griep, Jessica Hickman, Dan Jurgens, Peter Krause, Michael May, Doug Mahnke, Tom Nguyen, Gordon Purcell, Brent Schoonover, Barbara Schulz, Brandon Terrell, and dozens more. Of course, I'll be there, too, selling and signing books at my own table. The Dealer list is also more diverse this year, and the layout of MicroCon is different, so make sure you don't miss anything. Some things at MicroCon remain the same, though, with easy Guest Creator access, hundreds of prizes & grab bags, a terrific 55,000 square foot marketplace, and a world of super-surprises. I always have a grand time at MicroCon, so I hope you'll come and invite your family and friends to join us. MicroCon is a Comic Book Party where everyone is welcome and there's something for everyone! Before that look of horror freezes on your face, I should stress that, yes, of course, my parents were married. To each other, even. No problem there. The title of this particular blog actually refers to the fact that after twenty-two years as a published author, having written hundreds of stories, I finally, at long last, have made it into the Science Fiction Book Club! My new Superman book, The Stolen Super-Powers, is one of this month's featured selections. Very cool. I guess that means I can actually consider myself, perhaps even refer to myself, as a "science fiction writer", and that means more to me that you might think. My whole early motivation for reading, and love of books, was sparked by science fiction and other imaginative literature. 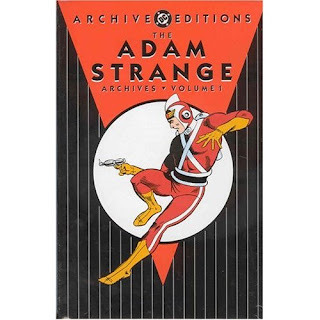 Through ragged, often coverless copies of my older brothers' Classics Illustrated comic books I was introduced to H.G. Wells, Jules Verne, Mary Shelley, Robert Louis Stevenson, and others. I anxiously waited every week for new episodes of Lost in Space, The Twilight Zone, The Outer Limits, and The Adventures of Superman. Thanks to Forrest J Ackerman's magnificent Famous Monsters of Filmland magazine I knew which movies to look for, scouring the TV listings in the newspaper for iconic broadcasts of King Kong, Bride of Frankenstein, and The Wizard of Oz. By the time I was in junior high school I was venturing into the wee hours to catch reruns of Star Trek, and reading the nights through with the newest Doc Savage paperbacks. Science Fiction had already long been in my blood, but by then it was really rolling to a boil. Around that same period I fatefully read a Richard Matheson short story called "Born of Man and Woman". It was a brief little thing, not more than five or six pages, but it profoundly affected me. In fact, that disturbingly emotional and terrifying tale changed me forever. Somehow I felt different after reading it. Suddenly, I'd realized exactly what I wanted to do with my life. I would someday grow up to be a science fiction writer, too! It's been a long road. There have been sacrifices, to be sure, in following my vocation. And I don't think I've ever really grown up. Still, even as a naive little kid in Kentucky, I knew that a writer's life wasn't going to be easy. It hasn't been. I've lost cherished relationships, worked many vacuously abysmal part-time jobs, and undoubtedly forfeited a traditional family of my own in my pursuit of my Muse. It's not like I ever had any real choice, though. I don't pursue and, thankfully, maintain this career because I merely necessarily want to. Like most of my friends, whether they be writers, artists, musicians or actors, I do this because I must. After all these years I'm still bewildered by my love of outer space, time machines, and dinosaurs. I don't understand it. I don't try. I only know that they are a part of me and I believe they have done me good. "Remember kids, don't Drink, Smoke, or Dope. Get High on Sci-Fi!" Sorry for the recent lack of new posts. Astonishingly swamped with work. Things will calm down a bit after the early part of next week. For now, I'll leave Boris and Trudaloo to entertain you during my absence. I'll return in a couple days. The Gift that Cannot Die! Yesterday I received some wonderful, and timely, news from Joe Gentile, publisher of Moonstone Books. 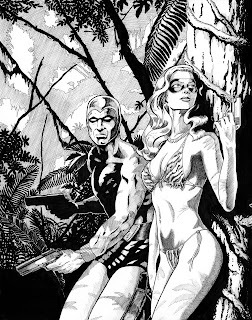 After re-reading my Phantom/Domino Lady story recently published in the Domino Lady anthology, Joe somewhat miraculously asked me if I'd like to write a new Phantom mini-series. Well, I couldn't type the word "yes" fast enough! I've loved Lee Falk's Ghost Who Walks for almost as long as I can remember, first introduced to me by my older comics-reading brothers. 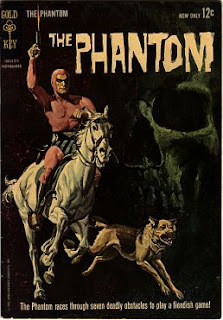 In fact, The Phantom just might be my favorite comic book character, if I was pressed to choose only one. So, obviously, you can begin to get a sense of what a fabulous birthday present Joe had given me! Of course, before teaming him with the Domino Lady, The Phantom and I had already crossed paths, professionally speaking. 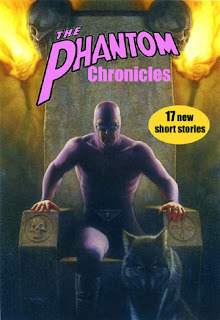 A few years ago I contributed to Moonstone's The Phantom Chronicles (as pictured above) with "The Hungry Swamp", an emotionally charged adventure set in New Orleans during the turmoil of Hurricane Katrina. I loved writing that story. I'd never before felt such mythic weight from a fictional character, not even Sherlock Holmes. I experienced a kind of reverent, almost hallowed atmosphere when approaching The Phantom, that I've rarely known since--and then it was with Superman and Batman. I'm very much looking forward to experiencing that feeling again. I have a thing about birthdays. It's deep, personal, and I'm not exactly certain why I dread them so much. Once they finally arrive, all is usually well. My world doesn't end and I feel just as much like myself as I did the day before. It's a strange phenomenon. Perhaps it's the disturbing realization that with each passing year, heck--with each passing moment--we're closer to becoming ghosts. Morbid thought, perhaps, depending on your point of view. I think being a ghost could be rather cool. Point is, birthdays are kind of scary for me. 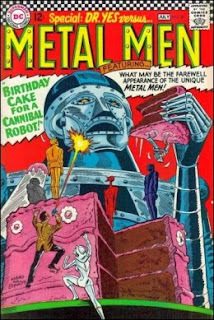 Or, more exactly, the approach of a birthday. I start to feel this crawling panic under my skin. I glance too often at the calendar, or purposely avoid it all together, pretending it isn't there, that Time itself doesn't exist. Sleep doesn't come easily to me in the best of nights, but my insomnia rages even more savagely during these lonely vigils. Much too-wide awake, I wonder and fret about my life and my career--which to me are much the same thing. How far have I come? Am I closer to my dreams than this time last year? What can I do better? How can I work harder? Then, the birthday event itself comes and everything is all right. Didn't hurt a bit, actually. As the day wears on I start to feel like I'm coasting downhill. Each moment is easier. It's all back to normal, or at least as normal as things ever are for me. Don't get me wrong. I highly value and appreciate this strangeness. Sort of feels like, every now and then, maybe only for a micro-second, I catch the Universe's attention and it winks back with another magic trick before dismissing me again. But it noticed me. And I noticed it back. 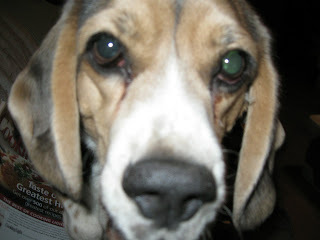 Lisa and my beloved four-legged family, and my amazing friends, help me to feel snug and necessary. And I love them fiercely. My next book whispers to me. Have a slice of cake, everyone. Always tastes better when it's served to you by a robot. The Domino Lady was created by Lars Anderson for the May 1936 issue of Saucy Romantic Adventures, a "spicy pulp" magazine that featured racy and provocative short stories. 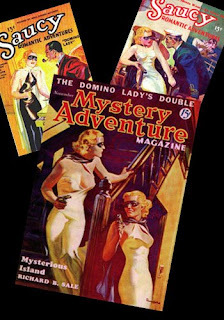 Probably modelled after blonde bombshell, 1930s starlet Jean Harlow, the Domino Lady originally appeared in only six published adventures. The stories were fast-paced, often a bit naughty, and were usually more concerned with describing her undergarments than progressing with the plot. However, the Domino Lady herself emerged as a strong and clever female protagonist, well ahead of her time. She had nerve, skill, and brains...as well as being a very classy dish. She's also an awful lot of fun to write. Pulp readers will be pleased to know that Moonstone Books has resurrected the Domino Lady in this brand new anthology, featuring all-new stories by Lisa Bandemer, James Chambers, Chuck Dixon, Ron Fortier, Rich Harvey, C.J. Henderson, Nancy Holder, K.G. McAbee, Bobby Nash, and me. I just received my comp copies today and the book is absolutely beautiful, another real class act from Moonstone, clearly showing their adamant love of pulp adventure. I'd like to publicly express special thanks to Lori and Joe Gentile for convincing me to join in the fun, after my original hesitancy. There's no way I would have passed up writing Lee Falk's The Phantom again, and having the Ghost Who Walks meet the Domino Lady seemed like a natural. My story, "Masks of Madness", is dedicated to the memory of Philip Jose Farmer. This one's for you, Phil...where ever you are. Wouldn't have done it without you. Okay...I apologize...well, sort of, for my last post. Congratulations to everyone who caught my April's Fool joke for what it is. I don't normally do this kind of thing, but I just couldn't resist. Actually, I had some genuine inspiration which might surprise you. In truth, I made up very little of that "Monster Fossil" story. Aside from the size of the animal, which is really less than a meter in length, and the quotes from the fictional scientific personalities (did you catch all the name homages? 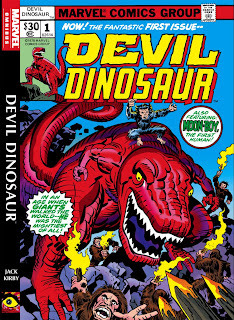 ), and their resulting insanity, this paleontology report is pretty much dead on. Even the posted graphic, showing how the creature might have looked alive, is authentic. The real article--yes, seriously, it's true--is pasted below. Still pretty cool, I think. The whole abandoned fossil premise, forgotten and lost in the web-haunted depths of a museum vault, is what engaged me to compose this story, which was just as much a little creative exercise as it was an April Fool's joke. I hope you will all forgive me, but this was just too much fun. News of a unique discovery has recently rocked the Paleontological world, proportedly promising to completely rewrite the prehistory of life on planet Earth. The fossil of a monster predator with a circular jaw and a pair of claws on its head has been uncovered in the old collections of the Smithsonian museum in Washington, researchers revealed on Wednesday. The mysterious fossilized remains of the creature were unearthed in 1912 in Canada's 505 million-year-old Burgess Shale site, but were never officially described or fully cataloged. During a random search of the Smithsonian's lower vaults researchers discovered the complete specimen, some four meters long, weighing three tons, wrapped in a decaying burlap field jacket, covered with webs from poisonous Black Widow spiders. The question of exactly what the creature is continues to be debated. Except for its great size, the fossil contains some jellyfish and sea cucumber features with arthropod and mollusk-like characteristics. "This is a completely new beast," remarked Chapman Cooper, Ph.D, an award-winning specialist in evolutionary biology. "We've never seen anything like it. It's a very charismatic critter, that's for sure. It's difficult to take your eyes of of it." The fossilized animal has a segmented body covered with gills and a huge three-part carapace, or shell, that projects out from the front of its head, according to Cooper. "This structure is unlike anything seen in other fossil or living arthropods, if, in fact, that's what it is," agreed Greta Whatley, Ph.D, who has been studying anomalous fossils for twenty years at the Smithsonian. "The use of the large carapace extending from the front of its head is a mystery. It seems to suggest the presence of something similar to a sizable brain, like what we would expect in much higher life forms. We can only guess at what its function might have been. I must admit, studying it as closely as I have, the thing tends to have a sort of hypnotic effect. I somehow lost over four hours in time yesterday that I can't account for. Clearly the two things aren't related, but that does give you the sense of how fascinating this creature is. You almost expect it to speak to you. " A new expedition is currently being organized to return to the original dig site, in search of more specimens. Although originally slated as leaders to the expedition team, both Cooper and Whatley were suddenly hospitalized for what an unnamed source has described as complete mental breakdowns. "Both scientists are simply exhausted," explained curator Ray Willis. "Can't say I blame them. Just spending a little time with this weird fossil is enough to give anyone the ebee-gee-bees."